Well the snows have definitely arrived. Even to deepest darkest Lanarkshire. The magnificent bump that is Tinto hill has had it's winter coat on for a few days. You only have to look to at the webcams to see how the snow has fallen elsewhere. A right winter wonderland. Stick another log on the fire and top up your glass of mulled wine and delve into this weeks trips. We can't talk about winter unless we include the Cairngorms. This one includes a long traipse around the plateau, some frozen tents and the the local wildlife. Frozen Tents and Ptarmingans, A backpack around the Cairngorms. 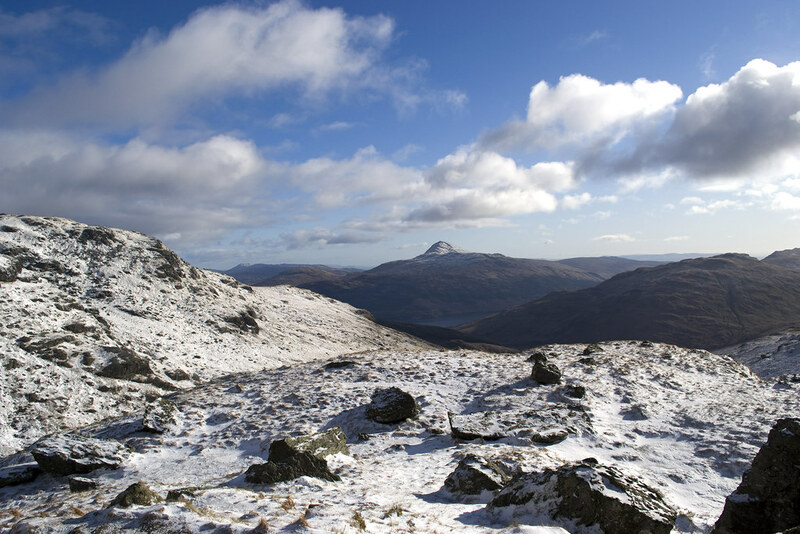 Fair enough that this one doesn't have any snow in it but BenLawers in the winter is an excellent walk. Plus I was amazed last week standing on my wee local hill watching the sunset and the moon rise, I could actually see Ben Lawers! I hadn't notice that before. Ben Lawers or the clouds lie below Coire nan cat. We started with some snow and we shall end with some snow. The wilds of Torridon and it's epic views all sprinkled with the lovely white stuff. Torridon Diary - Day 1: First Snowy walk of the year. I hope that all that snow didn't make you feel too cold or send a shiver up your spine. As usual leave a comment in the boxes below.